The Hong Kong China Temple is the 48th operating temple of The Church of Jesus Christ of Latter-day Saints. On 3 October 1992, President Gordon B. Hinckley, President of The Church of Jesus Christ of Latter-day Saints from 1995 to 2008, announced that there would be an LDS temple in Hong Kong. However, finding a place on which to build proved difficult. Church leaders considered numerous temple sites but were unsatisfied with all. One obstacle was the high cost of real estate. Finally, the inspiration came to have the temple built on the site of the mission home and chapel. The temple design came to President Hinckley during a visit to the area in 1991. He and two General Authorities, Elders Monte J. Brough and John K. Carmack of the Seventy reviewed potential sites but could not settle on one. After an exhausting day, they retired to bed for the night. Early the next morning President Hinckley called the leaders together to show a non-traditional temple structure. This is the temple that was ultimately built and dedicated by President Hinckley. You can read the story behind the temple from Elders Monte J. Brough and John K. Carmack of the Seventy. A groundbreaking ceremony was held and the temple site was dedicated on 22 January 1994 by Elder John K. Carmack of the Seventy. 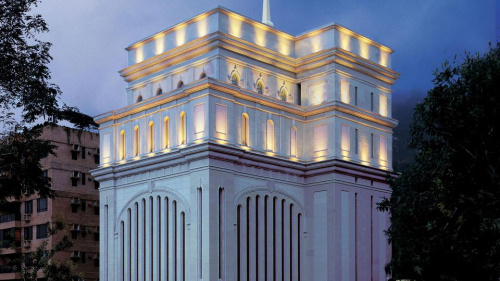 A public open house was held 7–21 May 1996, and the dedication of the Hong Kong China Temple took place on 26-27 May 1996 by President Hinckley. Many who attended the temple open house were impressed that amid the traffic and confusion of such a busy city there is such peace and tranquility found so easily inside the temple. The Hong Kong China Temple is located in the quiet residential district of Kowloon Tong, a suburb of Hong Kong on the Kowloon Peninsula. The striking edifice, characterized by Hong Kong colonial architecture, features high arching windows, ornamented walls, and a gold dome supporting the single spire and the gold-leafed Angel Moroni statue. Across the street from the temple is a three-story Church facility housing a meetinghouse, mission offices, housing facilities, and a distribution center. The Hong Kong China Temple serves Latter-day Saints from parts of India, Thailand, Sri Lanka, Mongolia, Guam, Hong Kong, Malaysia, Cambodia, Micronesia, Majuro, and Indonesia. It has a total of 21,744 square feet, two ordinance rooms, and two sealing rooms. The Hong Kong China Temple was the second temple built in mainland Asia, following the Seoul Korea Temple (1985), and the first built in China. The Hong Kong China Temple was the first multipurpose temple built by the Church, as envisioned and sketched by President Gordon B. Hinckley in the nighttime hours following a pleading prayer for inspiration. The Hong Kong China Temple was originally named the Hong Kong Temple. Elder David O. McKay of the Quorum of the Twelve Apostles dedicated China for the preaching of the gospel on 9 January 1921, within the walls of the "Forbidden City" in Beijing. Elder Matthew Cowley, a member of the Quorum of the Twelve Apostles, and Chinese native, Henry Aki, officially opened missionary work in Hong Kong by prayer on 14 July 1949, from the Peak—the highest point overlooking the city of Hong Kong. The Kowloon Tong chapel, Hong Kong mission home, and Hong Kong mission office, which stood on side-by-side lots, were all razed to make way for the Hong Kong China Temple. The temple and Church facilities across the street provided replacements for all these buildings. Elder John K. Carmack of the Seventy presided over the groundbreaking ceremony of the Hong Kong China Temple. Invited to attend were Hong Kong stake and ward leaders, their wives, and invited guests. The Angel Moroni statue was added to the spire of the Hong Kong China Temple on 12 December 1995. Several hundred spectators gathered to witness the Moroni raising. During its public open house, over 13,000 people toured the interior of the Hong Kong China Temple, including over 500 VIP guests and 25 ministers of other faiths. The Hong Kong China Temple was dedicated in seven sessions over two days. President Gordon B. Hinckley, who dedicated the temple, had participated in the dedication or rededication of all but five of the Church's operating temples. Hong Kong was under British rule at the time the Hong Kong China Temple was dedicated, but sovereignty transferred to China just over a year later on 1 July 1997. Following the dedication of the Hong Kong China Temple, President Gordon B. Hinckley became the first president of the Church to visit mainland China when he arrived in Shenzhen—a "sister cultural city" of the Polynesian Cultural Center in Hawaii. A replacement Angel Moroni statue was hoisted atop the Hong Kong China Temple on 5 August 2016, just over 20 years following the dedication. The First Presidency of The Church of Jesus Christ of Latter-day Saints has announced the closure of the Hong Kong China Temple for extensive renovation effective 8 July 2019. While the temple is being renovated, members are encouraged to attend other temples as their circumstances allow. This page was last edited on 31 January 2019, at 12:32.